"The translation into English of a modern Greek tale is a literary enterprise so unusual, not to say unprecedented, that it seems to call for some explanation, if not for apology. Loukis Laras appeared for the first time as a serial in that excellent Athenian periodical, the Hestia, during the early part of 1879. The popularity to which it rapidly attained rendered necessary its publication in a separate volume, and a second edition is already announced, a compliment not often paid to a book issued within the restricted limits of Greece. The merits of the work, however, were not long in being recognised by a wider circle of readers - those Greek scholars in the west of Europe who have given their special attention to the Mediaeval and Neohellenic epochs of Greek literature. The distinguished Hellenist, the Marquis de Queux de Saint-Hilaire, published last year, in Paris, a French translation, which elicited, in favour of M. Bikelas's work, so hight an opinion from those who had occasion to comment on it, that Loukis Laras has been included in the official list of books to be placed in the popular libraries, and to be awarded as prizes in the French Lycees. A German translation soon followed; it is the work of William Wagner, whose premature death has since left in the ranks of Hellenic scholars a gap not readily to be filled up. In Italy and in Denmark translations have also appeared - in the latter country from the pen of Professor Jean Pio; and the author has had more than one application for translations in other languages. 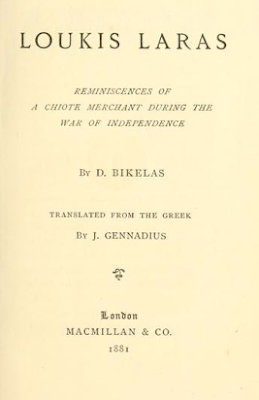 "Those of our countrymen who have resided in England will easily recognise the old Chiote merchant, who is here concealed under the name of Loukis Laras. Often have I heard him relate the vicissitudes of his early years; and it was at my suggestion that, towards the close of his life, he undertook to write his memoirs. When, a few years ago, he died, his manuscript notes were found amongst his papers under cover, addressed to me. In publishing them now, I wish they may be ready by others with as great an interest and pleasure as I experienced whenever I listened to the narration of the old gentleman." "In the early part of the year 1821 I resided at Smyrna. I was then nearly twenty years of age; and seven years had already elapsed since my master, Pappa Floutis - may God have mercy on his soul! - assured my father that I then knew quite as much as was necessary for a man destined to a business career. My father, either convinced by what the good old monk told him, or, perhaps, because he considered the training of a practical life more useful to me, did not think fit that I should continue my studies at Chio, but took me to his house of business at Smyrna, first as an apprenticed clerk, and shortly afterwards as a partner. . . . "